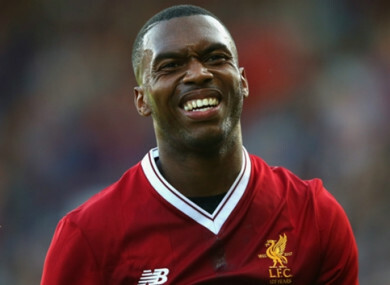 “WORLD CLASS” DANIEL Sturridge will be like two new signings for Liverpool if he is fit and firing this season, according to team-mate Adam Lallana. Despite links with Paris Saint-Germain and West Ham earlier in the transfer window, the striker has remained at Anfield and Lallana feels he is looking better than ever, tipping him for a huge 2017-18 campaign. Liverpool face Bayern Munich in the Audi Cup on Tuesday, having beaten Hertha Berlin 3-0 on Saturday as part of a pre-season campaign that has seen Sturridge play in all five games. While Jurgen Klopp’s men have so far failed to land Virgil van Dijk from Southampton and could not bring in Naby Keita from RB Leipzig, Lallana is buoyed by the form of Sturridge as the new campaign draws closer. “Studge has been absolutely brilliant in pre-season so far,” Lallana told reporters. “He’s looking really sharp and to have him firing on all cylinders would be like having two new signings, if we can keep him on the pitch and get him scoring goals. He is a world-class player. “He has come back from the summer in brilliant shape, so fit. He is going to be a massive player for us this season. I can feel it. You couldn’t put a price on him. Every footballer gets injuries – Jordan Henderson has had a tough couple of years. “We all have to deal with it at some stage in our career. But we have got plenty of options and if we keep everyone fit, who knows what can happen? We’re looking good at the minute. Liverpool’s are hoping for further signings after the arrivals of Mohamed Salah, Andrew Robertson and Dominic Solanke, but Lallana is not fazed by the prospect of other additions at Anfield. “I want the best players to be linked with Liverpool and coming to Liverpool,” said Lallana. “If you are talking about it from a personal point of view, the pressure to get better and the competition for places is healthy. That is what we need. “At times last year, our bench probably wasn’t as strong as we’d have liked it to be. If we are going to achieve something, we are going to need a strong bench. You only have to look at the substitutions the manager is making. He can replace pace with pace and goals with goals. Email “'World-class' Sturridge like two new signings, says Lallana”. Feedback on “'World-class' Sturridge like two new signings, says Lallana”.